Details: Join in the re-opening of the Brandywine Kids Play area! 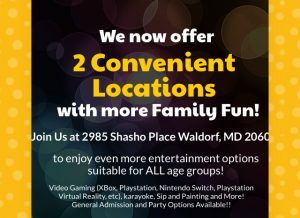 Bring your kids by for a fun-filled time at the store! The Grand re-opening will be from 2-5 PM. Details: Come out to cheer on your favorite team at this years CSM Robotics Challenge. This program was started in 2007 as one of the projects funded through the college’s National Science Foundation (NSF) grant. This event has grown over the years to become the premier robotics competition event in Southern Maryland. Only registered team members and coach are allowed in the arena. Spectators can watch the matches from the bleachers accessible from the second floor. Details: Score points with your loved ones and build a Valentine bean bag toss in this hands-on workshop. You and your child can construct a fun bean bag toss game for the whole family to love. Following the bean bag toss game board construction, your child can decorate it with paint and stickers. All Kids Workshop attendees must be accompanied by a parent or adult at all times. All kids get to keep their craft, receive a FREE certificate of achievement, a Workshop Apron, and a commemorative pin while supplies last. Children must be present at the store to participate in the workshop and receive the kit, apron, and pin. Details: Get in the Valentine mood by coming out to the shop this Saturday to decorate our homemade raspberry marshmallow hearts dipped in chocolate! Make them fun or festive ♥ The price is $2/heart and we hope you’ll bring the whole family! The shop is dressed in it’s Valentine’s best and we’ll have plenty of other goodies to tempt you while you’re here. Hope to see you Saturday! PAW Patrol Live! “The Great Pirate Adventure” Coming to Fairfax! Dates: Saturday February 3, 2018 @ 10:00 a.m., 2:00 p.m. and 6:00 p.m. & Sunday February 4, 2018 @ 10:00 a.m. and 2:00 p.m.
Tickets: $19.00, $40.00, and $50.00. A limited number of $70.00 Gold Circle and $135.00 V.I.P. (Very Important Pup) Packages* are also available. Additional fees and special offers may apply. *V.I.P. Package features premium show seating, a commemorative lanyard and an after-show Meet & Greet with PAW Patrol Live! walk-around characters. Ticket prices inclusive of a $2.50 facility fee. Tickets are available at the EagleBank Box Office, www.ticketmaster.com or by phone at 800-745-3000. Details: Toys R Us is having a free Pokemon Trade & Collect Event on February 3, 2018. Children ages 6 and up can get a free Pokémon Piplup foil card and a Pokemon trading card game poster and more at their local Toys R Us store from 12 to 2 p.m.. Details: Looking for something fun and entertaining to do this weekend? Cheer on local vocal group the Spartones (St Charles High) and other fierce a Capella as schools from MD, VA, NJ and NY compete for a chance to perform in the semi finals of the ICHSAs.